Alcohol 120% lets you create image files, make disc to disc copy, erase DVD’s, get complete information about disc drive, create virtual drives and burn ISO image files at maximum speed. Creating image files that based on data files, bootable content or anything else, it’s difficult job to handle them. Create images of important data as backup and mount these ISO/MDS image files to virtual disc drives. Additionally, create up to 31 virtual drives and mount them with a single click easily. A powerful data backup is necessary for personal, business and company based servers. Kids, virus or hacking attacks, unexpected power outages, delete or format data by mistake and corrupting of OS files will result as a lose of important data. As many of solutions, the most recommended and simple method is to create backup image file of important data and burn that image into CD or DVD disc. Burn image files directly from hard drive, make CD/DVD copy, burn multiple disc’s at once, mount image files to virtual disc drives, copy or move image file data without extraction, check DVD ROM as well as CD/DVD details. Alcohol 120% support all popular image file extensions including: .ISO, .CCD, .BWT, .MDS, .B6T, .B5T, .CUE, .ISZ, .PDI, .CDI and .NRG formats. Happy news for gamers because the latest games may include 4 or more DVD’s so its difficult to copy or extract all of them into HDD. Just simply mount them into virtual drives, run setup or play directly. Alcohol setup will install core files, multi language files, iSCSI service, A.C.I.D wizard, Data type analyzer, file extension management and desktop shortcut as well. 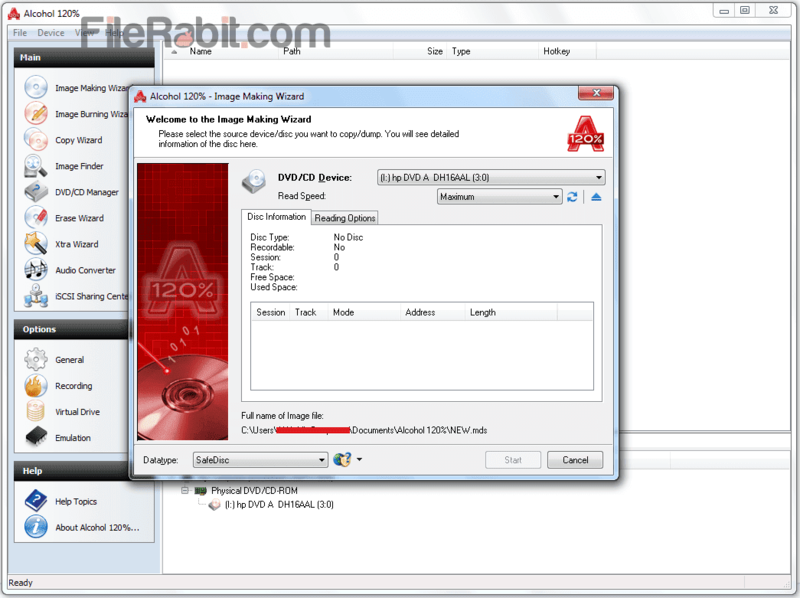 However, this is one of simpler, faster and professional software to manipulate anytype of disc or disc image file. User’s with minimum hard drive space are unable to extract large disc image files so just mount those image files and use without extracting. Integration with right click menu will make it fast to quickly add files or folders into disc image criteria. Dozens of virtual drives can be created in full version of Alcohol but the personal use has various limitations. Select DAO (Disc at Once) or TAO (Track at Once) method with adjusting burning speed. The pro advantage is to create multiple disc copies with writing number of copies. It also allows to RIP audio CD’s and convert it to supported formats.